Just moved to BigPipe although they said move is gonna happen tomorrow, sync speed dropped to 48Mbps from around 68-69Mbps. Is this normal? What exactly happens when you move? I thought it was only change in billing. What does chorus actually do in the move process? Hope I will get my speed back. 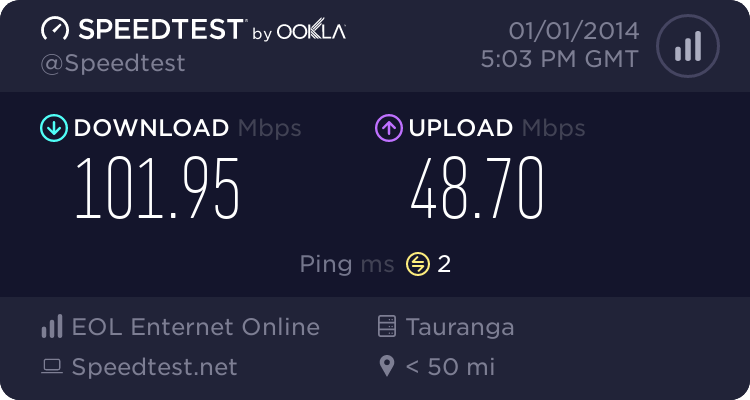 Speedtest.net showed around 64-65Mbps before now only 7-8Mbps. Something really wrong!!! nakedmolerat: This is vdsl right? If it is vdsl it is very close to the theoretical maximum. what speed do you get when you download a file or for example a torrent? 4k youtube video etc? Well yes it is VDSL I get lower speeds than before. Downloads in torrent were like up to 3.8 to 4 MBps before now only 1.4 But why did the speeds drop? quebec: Well yes it is VDSL I get lower speeds than before. Downloads in torrent were like up to 3.8 to 4 MBps before now only 1.4 But why did the speeds drop? Does "DLM training" happen again if you change ISP? It might get better over the next two weeks (don't restart your modem). 1) Sync speed change. This is possible when switching providers on VDSL since it resets and restarts the DLM process. it may change over the next 2 weeks, or it may not. It is something only Chorus control and has nothing to do with your choice of ISP. 2) Poor speedtest results (worse than expected on new sync speed). This could be a large number of things. Since PeterReader seems to be absent (probably out having a few beers on a Friday night) I'll re-post his questions. If you can answer those we'll have more info to be able to help diagnose the problem. Looks like a classic case of 17a dropping off with the profile resetting. Give it time, you will most likely get your 17a profile back at some point. Thanks. I can't play this video. It plays stops plays. My speedtest.net results are around 15.63Mbps on wired, what's yours? Have you checked you (or anybody else) isn't saturating your connection with things like torrents, software updates etc. Have you emailed our support team yet about it? They are the only ones who can look directly at your line to see what's going on. 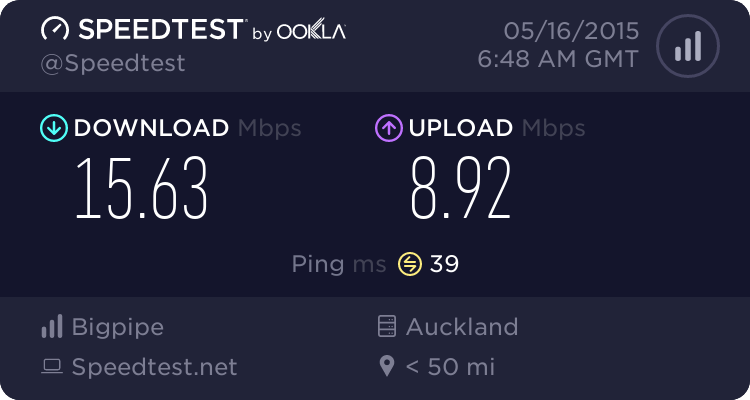 I've checked my own connection - similar sync to yours (45Mbps VDSL) and have no issues at all with speedtest or watching videos etc (including the video linked to above). Looking at our network traffic there is nothing unusual there either - plenty of bandwidth at our end.